Every couple weeks or so I see a new article from someone giving advice on how to trade volatility ETFs & ETNs such as XIV, VXX, SVXU, UVXY, and ZIV. Often the author will at least know that these products trade based on the VIX futures. But every once in awhile I'll see something more misguided, like the chart below. While it looks promising, once it is applied to historical data it does not deliver positive results. For example, let's take a look at the period between August 2004 and May 2006 when VIX bounced between 10 and 16 (VIX on left axis; VXX on right axis). The chart says buy VXX below a VIX of 16. The return for VXX during this time was -75%, a loss attributed to the fact that the front two months were in contango with a spread averaging 0.98. Let's continue on to the next period, between May 2006 and Feb 2007 when VIX was spending much of its time between 10 and 12. The result for VXX is a 57% loss, and again the reason is a contango term structure, with an average spread between front month futures (M1) and 2nd month futures (M2) of 0.85. You may point out the spike in VXX from $1000 to $1350 on the left hand of the chart, which is a nice 35% gain. 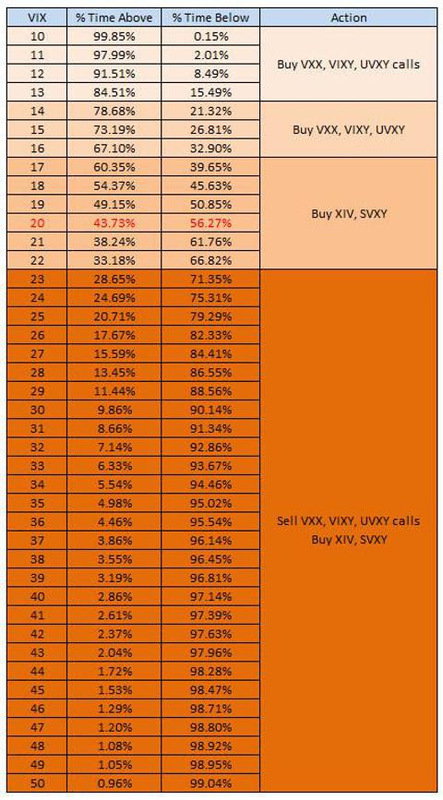 Unfortunately, if you were following the chart and buying XIV when VIX rose above 16 then you would have lost 30% over the next couple of weeks before almost breaking even if you held your position until VIX dropped below 16 again. OK, so I can hear some of you saying that I'm cutting off the chart before VIX and VXX spikes. Take a look at the next period, from Feb 2007 to Feb 2011 when VIX spiked during the 2008 crash. During this time VIX was above 16. Since the chart above says buy XIV when VIX is above 16, I'll compare VIX (left axis) to the price of XIV (right axis). The result is a 64% loss up until Dec 2007, followed by another 66% loss from Aug 2008 to Dec 2008, for a total of an 88% loss in XIV from 2/27/07 to 12/19/08. At this point your position has essentially been demolished after this 21 month period. But let's give you the benefit of the doubt and say that you stayed solvent and held on to this position for the 4 year period until VIX dropped below 16 again. In that case you managed to almost break even in that XIV trade. Looking at the term structure during this period, we find that between 2/27/07 and the bottom in 12/19/08 the term structure was in backwardation, with an average of a 0.67 spread between the first two months. Backwardation has the effect of making VXX rise and XIV fall. From 12/20/08 to 3/24/2011, when the price in XIV goes up from 2 to 14 for an excellent 7x return, the term structure is back in contango with an average of 1.51 points between M1 and M2. Contango has the effect of making XIV rise and VXX fall. At this point, the #1 rule in trading volatility-based ETFs should be clear: Follow The Term Structure. The term structure is going to be the biggest driver of price for volatility-based ETPs over time. There are of course other factors that need to be taken into account when trading volatility ETPs in order to maximize your gains, but you will be able to trade these products pretty well just by following this rule. To view the current term structure and other metrics that are critical to trading volatility ETPs, visit the VIX Futures Data page. **Note: VXX and XIV price data prior to the funds' first trading days (1/30/2009 for VXX and 11/30/2011 for XIV) have been calculated by using the VIX short-term futures underlying index values derived from actual data of month 1 and month 2 futures.